After Erin Song's parents ban her from using her phone, TV, Internet, and all her screens, she soon discovers mysterious, strange creatures and must foil their plot to take over Earth in this hilarious sci-fi graphic novel for tweens. Erin Song lives in a digital world. Everyone has a phone, a tablet, a computer—more screens than you can count. Even with a world of information at her fingertips, Erin can’t figure out the secret to popularity at her clique-y junior high school. So when uber-popular Wendy asks for help cheating on a test, Erin jumps at the opportunity. This could be her big break! Unfortunately, she gets caught, and her parents ban her from all her devices. Suddenly, Erin Song is the only girl in the world who’s not allowed to look at a screen. Tintin Pantoja has previously illustrated graphic novels such as WHO IS AC? (written by Hope Larson) and the MANGA MATH MYSTERIES series (by Melinda Theilbar). She enjoys journaling, fountain pens, and fine chocolates. 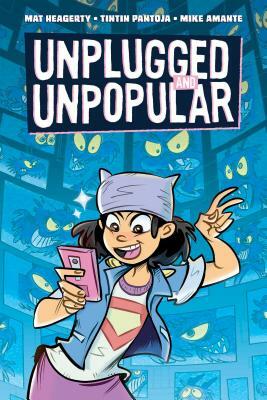 UNPLUGGED & UNPOPULAR is her first all-digitally-inked book, which means she'd be the first one brainwashed! She also loves bad puns and window shopping. Tintin lives in Manila, Philippines with four dogs and 1/2 cat. Mike Amante is a freelance children's book illustrator who has worked on the SHAHNAMEH FOR KIDS series and on OMF Literature books such as DYARAN! ANG KAMBAL NA HEBIGAT! (TADA! THE HEAVYWEIGHT TWINS!) and ANG ALLOWANCE NA HINDI BITIN. He loves to drink tea, listen to lo-fi music and read comics. He thinks aliens are cool so he made a bunch of minicomics about them. Mike currently resides in Laguna, Philippines along with his family and their overly energetic poodle.